The rich online image collections of the ETH Zürich hold countless treasures, including aerial photographs, historic bookplates, the collection of the Fotostiftung Schweiz, historic scientific instruments, field research photography in geology and botany, and historic photographs of buildings in Zurich. Many images are available with some type of Creative Commons license, or are in the public domain. A great deal of the collection consists of postcards, with some unusual examples such as this five-part accordion-folded panorama of Turin dating to around 1914. The ETH image archive also holds similar panoramas of numerous other cities and landscapes. Besides many variations on Alpine panoramas, these include Berlin, Bologna, Budapest, Lugano, Lyon, Palermo, Valletta, and Oahu! Bartolomeo Pinelli, Il Carnevale in Roma, 1815. 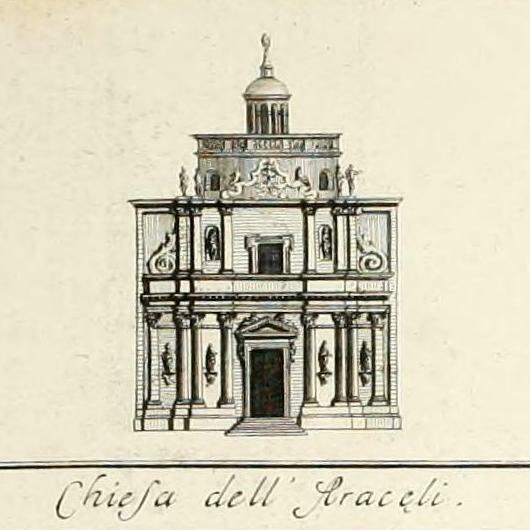 From: Nuova Raccolta di cinquanta costumi pittoreschi […], Plate 49. Charles Dickens lived in Italy for eleven months in 1844-45. He wrote about his stay in the travelogue Pictures from Italy, published the year after his return to England. 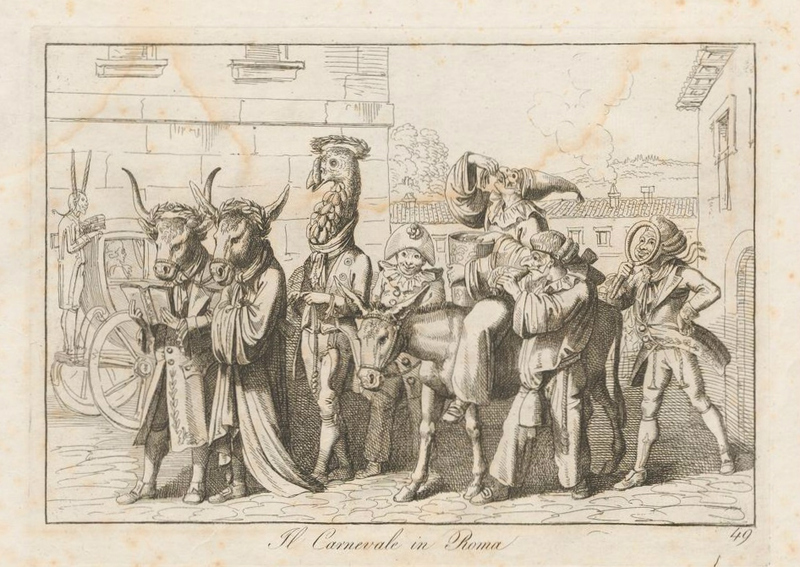 His vivid description of Carnival in Rome in the Pictures from Italy rivals Goethe’s famous account from nearly sixty years earlier. 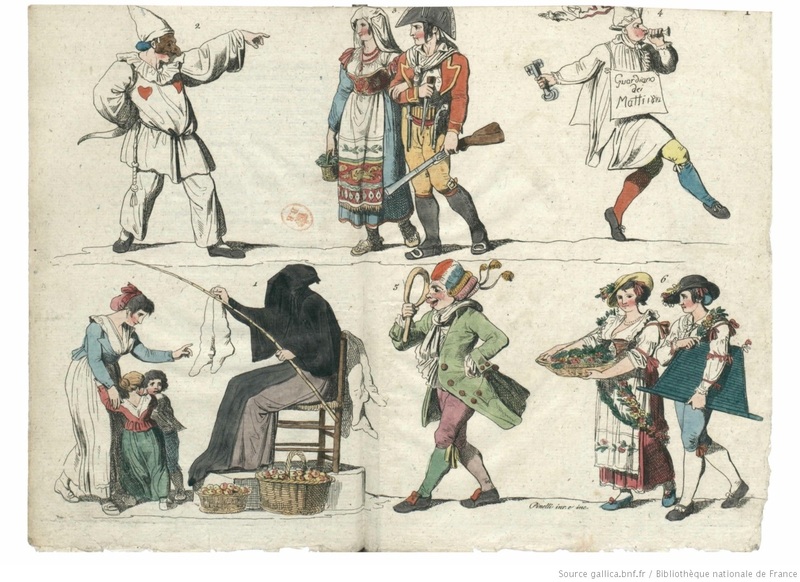 The amusing prints of the festivities by Bartolomeo Pinelli, dating midway between the two texts, perfectly capture details noted by both authors. – Charles Dickens, Pictures from Italy (London: Bradbury & Evans, 1846), pp. 178-179. Whether you celebrate Carnival, Carnevale, Shrovetide, Fasnacht, Mardi Gras, or Fasching … enjoy it while it lasts! Bartolomeo Pinelli, costumes of Roman Carnival, 1812. From: Lettre de M. Millin,… à M. Langlès, sur le carnaval de Rome (Paris: J.-B. Sajou, 1812). From: Martino Capucci, “Guarino Guarini Letterato,” Lettere Italiane 8:1 (Gennaio-Marzo 1956): 75-82 . To my knowledge, Capucci’s article has remained entirely unknown within the literature on Guarino Guarini. It is not included in any of the usual authoritative bibliographies on the Modenese Theatine. Yet Capucci’s essay coincided with the flowering of studies on Guarini and Piedmontese baroque architecture in the late 1950s through the 1960s, such as Paolo Portoghesi’s short monograph published the same year. Its omission can only be due to the disciplinary blinders that still plague Guarini research today. 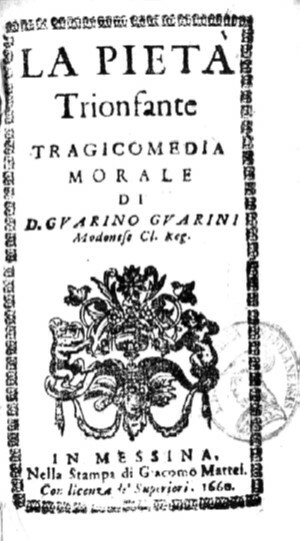 Few studies on Guarini make more than passing reference to La pietà trionfante, although a play based on it was produced in Modena in 2005, Le regole del cielo. Capucci’s article thus fills a notable gap in Guarini scholarship, providing important literary expertise to assist in our understanding of a figure who is fully comprehensible only through interdisciplinary efforts. Consult “Guarino Guarini Letterato” by Martino Capucci at this JSTOR permalink. 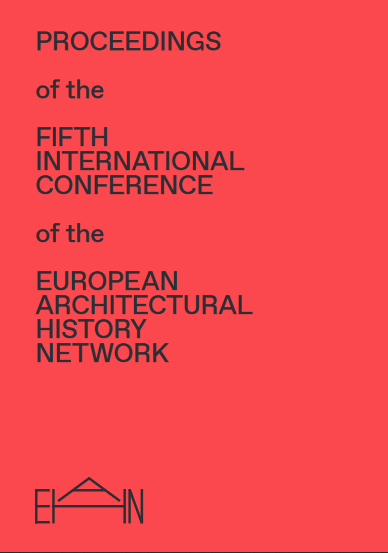 It deserves to be better known and to take its place within the standard literature on the architect. ● Martino Capucci’s colleagues at the University of Bologna prepared this booklet as a memorial tribute following his death in 2013. The biographical essay includes an account of the genesis of Capucci’s early essay on Guarini. ● Download Guarini’s La pietà trionfante from the Biblioteca Nazionale Braidense. At the threshold between the years 2018 and 2019, Giulio Romano’s group of Janus and Chronos in a preparatory drawing for the Sala dei Giganti at the Palazzo del Te seems a particularly appropriate emblem. They belong to the gathering of gods who have just vanquished the giants, toppling everything in their path. Janus – who gives January its name – looks backward (as an old man) and forward (as a youth), viewing the past as well as the future. Chronos (“Father Time”) strides ahead purposefully, while Victory seems about to place the victor’s crown on his head, marking the ultimate triumph of the inexorable march of time. (The position of this crown is shifted in the executed fresco.) Finally, at the lower right, a wistful Gaea looks on in horror at the violent end of the giants. After the upheavals of 2018, here’s hoping that Janus sees a bright future for us all in January and throughout the rest of 2019! For the past two years, the Fondazione 1563 per l’Arte e la Cultura has supported the research project Antico/Moderno. 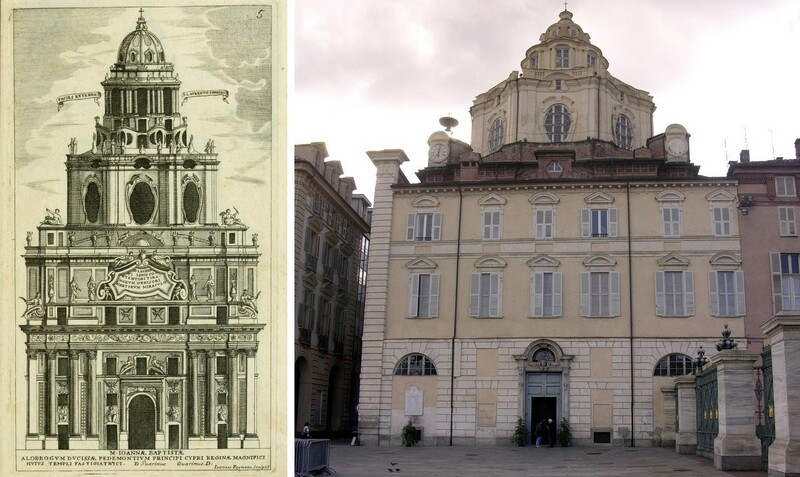 Parigi, Roma, Torino 1680-1750, which comprises several different strands of historiographic inquiry on the baroque, all coordinated by the scientific directors Michela di Macco and Giuseppe Dardanello. It has been a privilege for me to be involved in this stimulating initiative with such an inspiring group of scholars. For those who missed the conference Fortuna del Barocco in Italia: Le grandi mostre del Novecento in November 2016, all introductions, papers, and responses from the meeting may now be viewed in fourteen videos. A separate volume of conference proceedings is forthcoming in the series Quaderni di Ricerca of the Fondazione 1563. 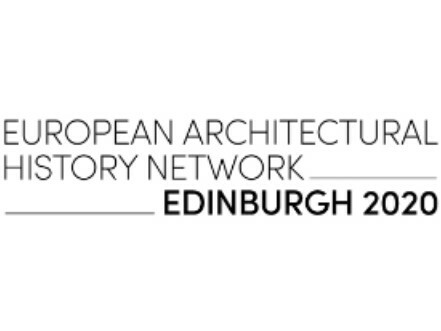 The opening remarks for the conference (video below) by the late Rosaria Cigliano, president of the Fondazione 1563, are particularly poignant after her premature death last month. The conference examined issues concerning the reception of Baroque painting, sculpture, and architecture in twentieth-century exhibitions in Italy, with a special emphasis on Piedmont. For a summary of the conference contributions, see my earlier post on the subject. The project component Barocco in Piemonte – Barocco in Europa: a cinquant’anni dalla mostra del 1963 involved several scholars working together with a seminar of students at the Università di Torino in order to reassess the history, historiography, and reception of the two large exhbitions of Piedmontese baroque art and architecture organized by Vittorio Viale in 1937 and 1963. Under the guidance of Sara Abram and Giuseppe Dardanello, the students worked to reconstruct the nearly forgotten exhibition of 1937, and compare it with the intervening evolution of the field as manifested in the second exhibition twenty-six years later. A forthcoming volume in the series Quaderni di Ricerca will publish this work, along with additional framing essays by established scholars. Abram and Dardanello presented initial results of this research at the conference Fortuna del Barocco in Italia in the form of videos reconstructing the two exhibitions. The Fondazione 1563 has made both films available online as well as a third video introducing the reconstructions (below). 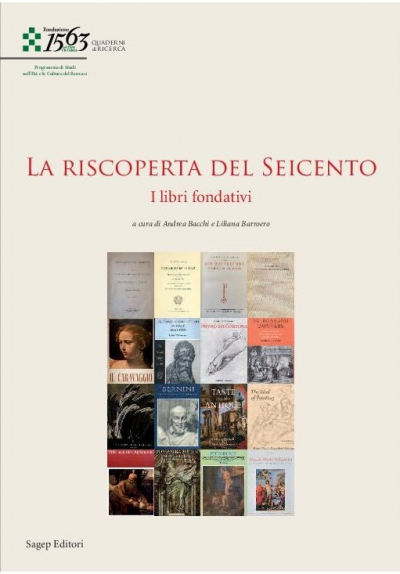 The first in a series of six volumes produced by the Antico/Moderno teams, La Riscoperta del Seicento. I libri fondativi, edited by Andrea Bacchi and Liliana Barroero, publishes the contributions to a three-part seminar held in Rome in spring 2016. Covering the late nineteenth through late twentieth centuries, each of the sixteen essays revisits a fundamental text of the art and architectural history of the Baroque, and situates it within the international historiography on the period. For more information, view the publisher’s flyer or the table of contents. Stay tuned in the coming months for additional research outputs from this initiative. The proceedings of the conference Bernini disegnatore: nuove prospettive di ricerca – held in Rome in April 2015 – have now been published. The collection includes initial results of my collaboration with Tod Marder on his new edition of Heinrich Brauer and Rudolf Wittkower, Die Zeichnungen des Gianlorenzo Bernini, 2 vols. (Berlin: Keller, 1931). 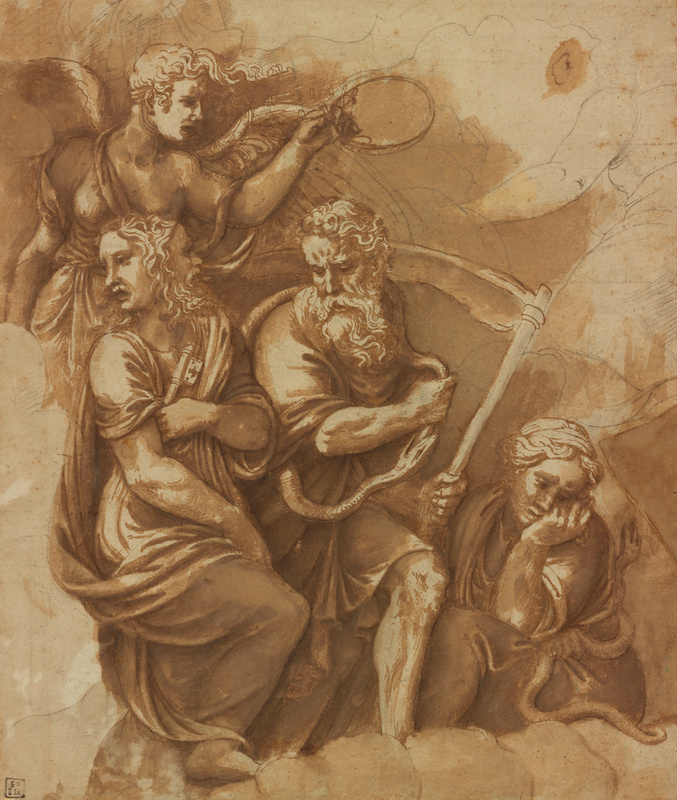 Our essay examines the historiography of Brauer and Wittkower’s classic catalogue of Bernini’s drawings, and situates it within the intellectual biographies of its authors. Other contributions consider the history of the various repositories of Bernini’s drawings, the typologies of Bernini’s drawings, and case studies of drawings for specific projects by the artist. I disegni del Bernini offrono una prospettiva privilegiata, un’opportunità di affrontare l’arte del cavaliere nella sua universalità come scultore, pittore e architetto, ma anche come inventore per le arti decorative, e ci permettono uno sguardo intimo nel laboratorio del genio, capace di adattare le sue invenzioni a circostanze in continua evoluzione e alle domande pressanti dei suoi committenti. Mentre l’esecuzione dei grandi progetti era delegata sempre più a una schiera di collaboratori altamente specializzati, il tratto personalissimo dei disegni ci riporta alla mano e al pensiero del Bernini. Sono disegni preparatori che fanno trasparire l’iter concettuale di occasioni grandi e piccole, ma anche studi di struggente naturalismo, ritratti parlanti di straordinaria vivacità e quei grandi disegni autonomi dell’ultimo Bernini, ormai non più semplice segno grafico ma strumento di contemplazione mistica. 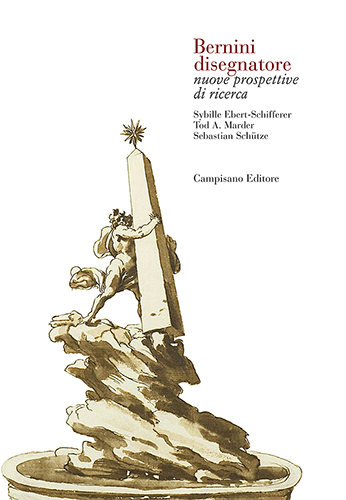 Sybille Ebert-Schifferer, Tod A. Marder, Sebastian Schütze, editors, Bernini disegnatore: nuove prospettive di ricerca, Storia dell’Arte (Rome: Campisano Editore, 2017). 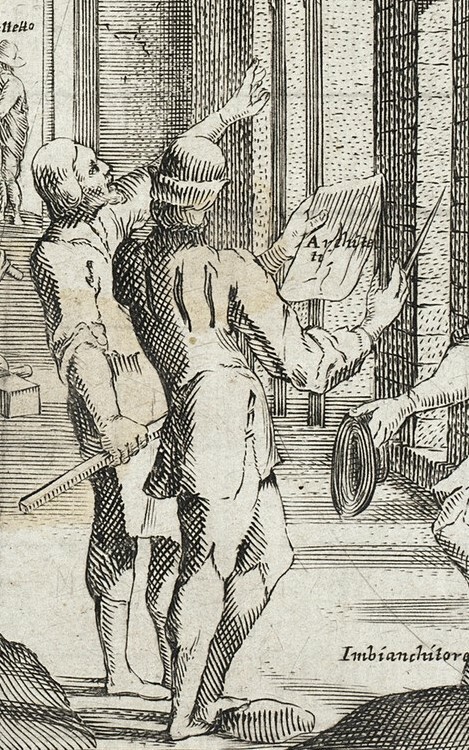 Francesco Curti, Virtù et arti essercitate in Bologna (Trades Practiced in Bologna), Plate 6 (Building Trades), mid-17th century. 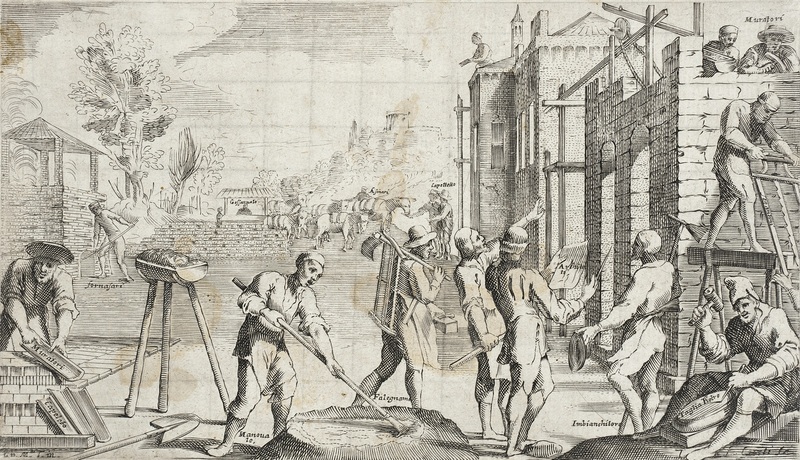 This print – one of a group of twenty depicting various trades – provides an excellent overview of the different kinds of workers found at an early modern construction site. Here, the specific context is mid-seventeenth-century Bologna, and the artist Francesco Curti illustrates around a dozen specific jobs, most conveniently labeled. The range runs from the foppish architect – identified as “architetto” on the sheet of paper he holds – through the masons (“muratori”), painter (“imbianchitore”), stonecutter (“tagliapietre”), and unskilled manual laborer (“manouale”) apparently mixing mortar. Other figures include donkey drivers (“asinari”), a sawyer (“segantino”), a kiln operator (“fornasaro“), a plaster maker (“gessaruolo”), and a carpenter (“falegname”). Many of these vocational designations varied regionally – for instance, the “tagliapietre” was elsewhere known as a “scalpellino” – but the jobs performed were similar all across Italy. The man standing to the left of the architect is most likely a misuratore, a building surveyor who measures the completed work for calculating the materials used and thus the costs. He holds his attribute, the measuring rod, but is not explicitly labeled with his occupation. Nonetheless, his role was central to the successful practical and financial administration of the building site. The image gives an unusual glimpse into an active cantiere in Seicento Italy, and can serve as a valuable illustrated glossary for countless construction documents of the period. Do note the related plate with artists – painter, sculptor, relief carver, and engraver – but also merchants, soldiers, artillery specialists, and a letter carrier! Last week, the Turin cultural sponsoring consortium Consulta per la Valorizzazione dei Beni Artistici e Culturali di Torino announced the upcoming work Pietre preziose that it commissioned from the artist Giulio Paolini. The sculpture, to be installed in the Giardini Reali behind the Palazzo Reale in Turin, will incorporate architectural fragments of Guarino Guarini’s Chapel of the Holy Shroud, which was severely damaged by fire in 1997. The sculpture will be unveiled on 26 October. The Consulta prepared a preview video of the work (below) and issued a press release describing the project. To judge by the video, the work will consist of the architectural fragments of black Frabosa marble arranged on a stylized plan of the Chapel of the Holy Shroud, with additional new figural elements. The piece should be a highlight of the newly restored royal gardens, adjacent to the palace wing containing the chapel. Additional reporting on the preview of Pietre preziose is available in La Stampa and La Repubblica. Currently, restoration of the Chapel of the Holy Shroud itself is scheduled for completion in 2018. With Easter approaching, the annual sindonology season is upon us. This year’s curiosity comes from the vast, encyclopedic collection of the Metropolitan Museum of Art in New York: a miniature replica of the Shroud of Turin. While the original relic is around 4.5 meters long, this small version measures just over a half-meter in length. 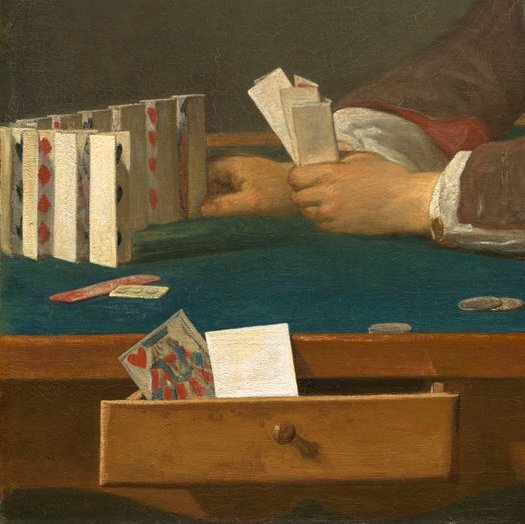 According to the museum’s catalogue record, the replica is painted on the cloth and was acquired in 1888. The image of the Shroud – complete with the burn marks from the fire in Chambéry in 1532 – is surrounded with a floral border, an inscription, images of symbols and instruments of the passion at the corners, and two baskets of flowers at either side. The textile probably dates to the nineteenth century, and must have been intended as a devotional souvenir for pious pilgrims to the venerated relic. The Metropolitan Museum also holds a photographic souvenir of the Shroud of Turin in its collection. The negative image of the face on the textile was taken by Giuseppe Enrie and dates to the 1931 ostension of the Shroud. The museum’s website offers an extremely informative catalogue entry on the photo and its context in Enrie’s career. The video below gives a glimpse of the souvenirs available for contemporary pilgrims to the relic.